Jaime is a young researcher examining the use of interactive video game technologies as a tool to improve physical and mental health. Until recently, Jaime worked as a Software Engineer at Neuroscience Research Australia, primarily designing, developing and maintaining fall prevention video games and mobile apps for the Falls Balance Injury Research Centre. 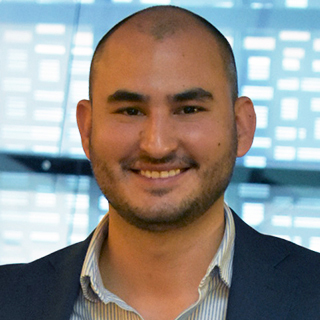 He holds a PhD in Software Engineering and Information Systems from the Faculty of Engineering and Technology at the University of Technology Sydney (UTS) and a BSc in Computer Science and Engineering from the Pontificia Universidad Javeriana Cali (Colombia). His most relevant projects are the StepKinnection system (a bespoke Kinect game to prevent falls in the elderly) and the MobileRehApp (an Augmented Reality mobile game for ankle sprain rehabilitation). These projects have led to a series of high-quality publications in well-established international conferences and journals. Jaime has been the recipient of several scholarships including the UTS IRS Scholarship for International Students and the iNext Serious Game Scholarship, among others. He has also been awarded with the Branko Cesnik Award for the best scientific paper in 2012 and 2015. Jaime’s work has been profiled in the Sydney Morning Herald, the Australian Ageing Agenda, the Enquiring Minds Television Show on TVS and the UTS News Room. Systematic review evidence has shown that step training reduces the number of falls in older people by half. This study investigated the feasibility and effectiveness of a bespoke Kinect stepping exergame in an unsupervised home-based setting.An uncontrolled pilot trial was conducted in 12 community-dwelling older adults (mean age 79.3±8.7 years, 10 females). The stepping game comprised rapid stepping, attention, and response inhibition. Participants were recommended to exercise unsupervised at home for a minimum of three 20-minute sessions per week over the 12-week study period. The outcome measures were choice stepping reaction time (CSRT) (main outcome measure), standing balance, gait speed, five-time sit-to-stand (STS), timed up and go (TUG) performance, and neuropsychological function (attention: letter-digit and executive function:Stroop tests) assessed at baseline, 4 weeks, 8 weeks, and trial end (12 weeks).Ten participants (83%) completed the trial and reassessments. A median 8.2 20-minute sessions were completed and no adverse events were reported. Across the trial period, participants showed significant improvements in CSRT (11%), TUG (13%), gait speed (29%), standing balance (7%), and STS (24%) performance (all P<0.05). There were also nonsignificant, but meaningful, improvements for the letter-digit (13%) and Stroop tests (15%).This study found that a bespoke Kinect step training program was safe and feasible for older people to undertake unsupervised at home and led to improvements in stepping, standing balance, gait speed, and mobility. The home-based step training program could therefore be included in exercise programs designed to prevent falls. This paper presents the StepKinnection game, a Kinect-driven stepping game for the elderly that delivers stepping exercises to train specific cognitive and physical abilities associated with falls. This system combines a set of suitable age-related features, meaningful exercise routines and an embedded clinical test for fall risk assessment. The combination of these three aspects makes the game potentially useful in practice as the game is appealing to the elderly cohort, trains one of the most important abilities to prevent falls and at the same time allows for a continuous assessment of health outcomes; characteristics not available in the literature nor in current commercial games. Falls are the leading cause of disability, injuries or even death among older adults. Exercise programmes that include a balance component reduce the risk of falling by 40%. However, such interventions are often perceived as boring and drop-out rates are high. The characteristics of videogames may overcome this weakness and increase exercise adherence. The use of modern input devices, such as the Microsoft Kinect, enables quantification of player performance in terms of motor function while engaging with games. This capability has just started to be explored. The work presented in this paper focuses on the development of a Kinect-based system to deliver step training while simultaneously measuring parameters of stepping performance that have shown to predict falls in older people. © 2018 ACM. Falling is, unfortunately, a leading cause of injury and death in the global elderly population. However, it has previously been shown that increased physical and cognitive activity can decrease the occurrence of falls in the elderly. This paper investigates the potential for a long-term, unsupervised fall prevention training tool in the form of the StepKinnection game, which was designed to exercise both reflex times and movement speed while also providing entertainment. Specifically, this game was used in a three month user study consisting of 10 participants over the age of 65. Adherence to the training program, enjoyment of the game, and ease of use of the game were investigated using a custom usability questionnaire, four established usability scales, heuristic evaluation of gameplay data, and semi-structured interviews. Results show that participants generally had positive attitudes towards the game, they felt that they would engage with this training program more than there current exercises, and that the game was easy to use without guidance or supervision beyond the initial set up support and instructions provided at the start of the experiment period. © 2018 IEEE. This paper provides a preliminary appraisal of combining commercial skeletal tracking and virtual reality technologies for the purposes of innovative gameplay interfaces in fall prevention exergames for the elderly. This work uses the previously published StepKinnection game, which used skeletal tracking with a flat screen monitor, as a primary point of comparison for the proposed combination of these interaction modalities. Here, a Microsoft Kinect is used to track the player's skeleton and represent it as an avatar in the virtual environment while the HTC Vive is used for head tracking and virtual reality visualization. Multiple avatar positioning modes are trialled and discussed via a small self-reflective study (with the authors as participants) to examine their ability to allow accurate stepping motions, maintain physical comfort, and encourage self-identification or empathy with the avatar. While this is just an initial study, it highlights promising opportunities for designing engaging step training games with this integrated interface but also highlights its limitations, especially in the context of an unsupervised exercise program of older people in independent living situations. The Choice Stepping Reaction Time (CSRT) task is time-based clinical test that has shown to reliably predict falls in older adults. Its current mode of delivery involves the use of a custom-made dance mat device. This mat is a measurement tool that can reliably obtain step data to discriminate between fallers and non-fallers. One of the pitfalls of this test is that the technology in use still imposes an obstacle on the degree of freedom to be able to perform adaptive exercises suitable for the elderly. In this paper, we describe a Kinect-based system that measures stepping performance through the use of a hybrid version of the CSRT task. This study focuses on assessing this system's capabilities to reliably measure a time-based clinical test of fall risk. Results showed a favorable correspondence and agreement between the two systems, suggesting that this platform could be potentially useful in the clinical practice. People struggle to recover from injuries due to the lack of commitment to their rehabilitation exercises as they are often boring. Recent approaches that involve the use of interactive video games have shown positive results in exercising as users engage in physical activity while playing a game. For example Nintendo Wii and Microsoft Kinect based games have shown to be effective in the treatment of post stroke patients. Yet, there are not tools in the market that offer portable rehabilitation exercises in the form of interactive games. The work presented in this paper focuses on the development of the Mobile RehApp™, an augmented reality based application for mobile devices designed for therapeutic support that aims to assist physiotherapists and patients on ankle sprain rehabilitation. This paper reports on a series of interviews with three mainstream and three alternative/complimentary health professionals about the use of interactive technologies as a tool to improve the physical and mental well-being of the elderly. The questions are based around an Analytic Framework for investigating Interactive Technologies and the elderly. Four balance games using the Wii were demonstrated to the interviewees and their opinion of the suitability or otherwise of these games are discussed. The chosen games did not meet with universal approval but did provide us with useful insights on how to ensure the development of appropriate games for the elderly. This paper presents the results obtained after performing a number of demonstrations followed by a series of interviews concerning the usage of interactive games as a tool to improve both physical and mental well-being of elderly persons. This study points out the importance of a proper design regarding the usability of video games for the aged to ensure the elderly benefit from such games. This paper proposes a dynamic and customizable layered serious game design framework for improving the physical and mental health of the aged after presenting the results obtained from a study with mainstream and alternative/complimentary health professionals concerning the usage of interactive games as a tool to improve both physical and mental well-being of the elderly. This study reports on the commonality of design and health factors regarding the usability of video games for the aged to ensure the elderly benefit from traditional and alternative healthcare professionalsâ perspectives. this paper aims to provide a snapshot of the current status in the field of serious games for improving the physical health of the elderly. This work covers recent research projects for stroke rehabilitation and for falls prevention where user-center design methodologies were applied in order to satisfy this audience. A classification of the most relevant work in this area is provided along with a brief description of the platform, technology required and user-center design principles applied.